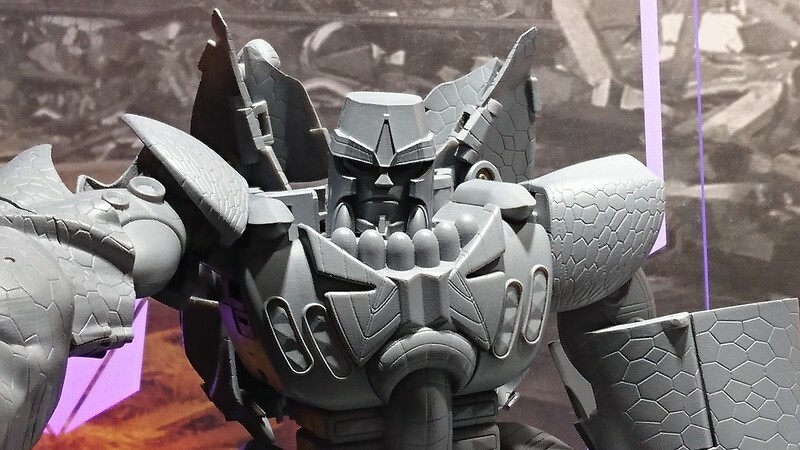 Thanks to Planet Iacon on Facebook and あると鉄火@AKG委託予定 on Twitter, we have even more Masterpiece news for you, this time in the form of the giant purple people eater himself: Beast Wars Megatron! 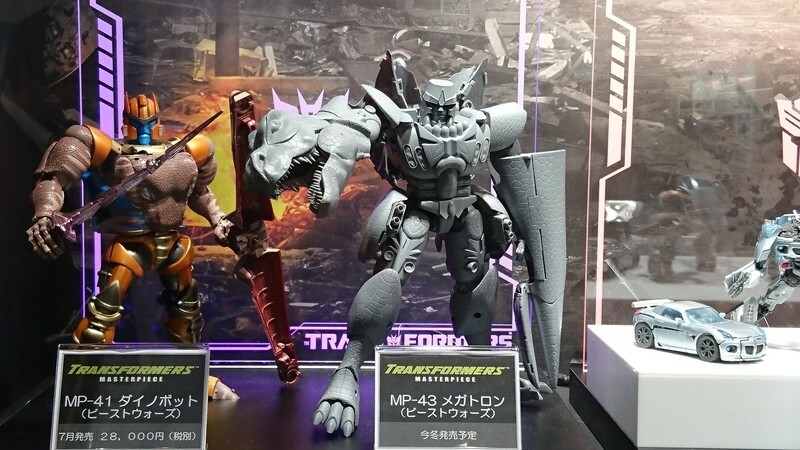 The new masterpiece figure was revealed to us at the Shizuoka Hobby Show, where a gray prototype has been photographed next to the upcoming MP-41 Dinobot, visible just to the left. 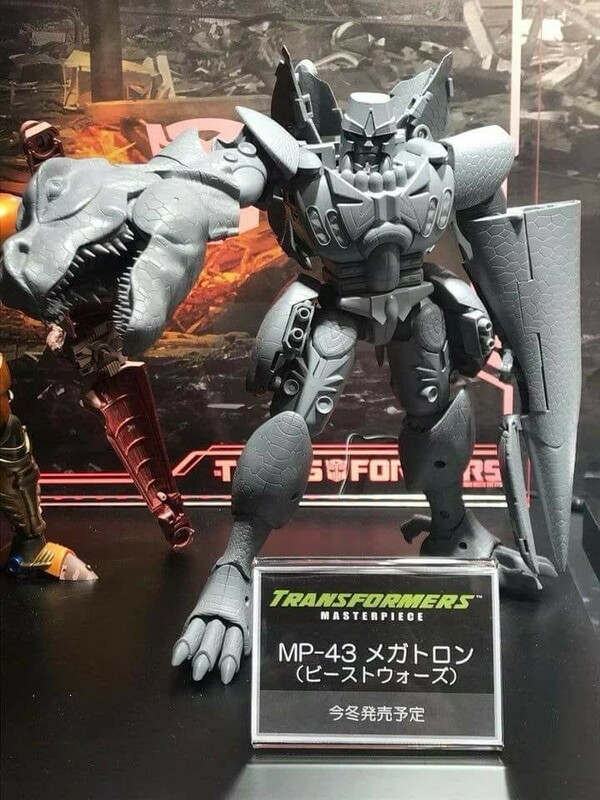 Based on the size of the prototype in relation to Dinobot, he looks to be a very big figure, Yessssssssssss. He even comes complete with the T-Rex head as his right hand and the tail as his left. 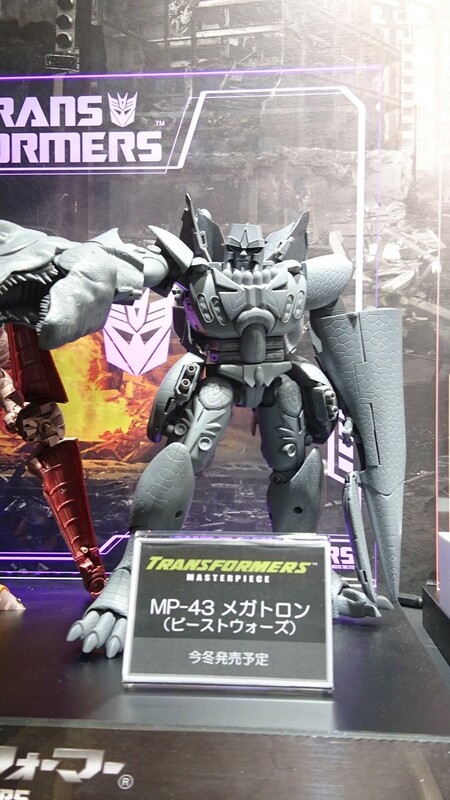 We have no further information on this figure at this time, though we imagine we will be getting many new pictures and details in the comings days. So check out this prototype, and let us know what you think in the comments section below! You and me both... I am still shaking and now I gotta go post your post about Whatshisfaces toy head. He looks so gooood! I already know the price tag is gonna sting though. 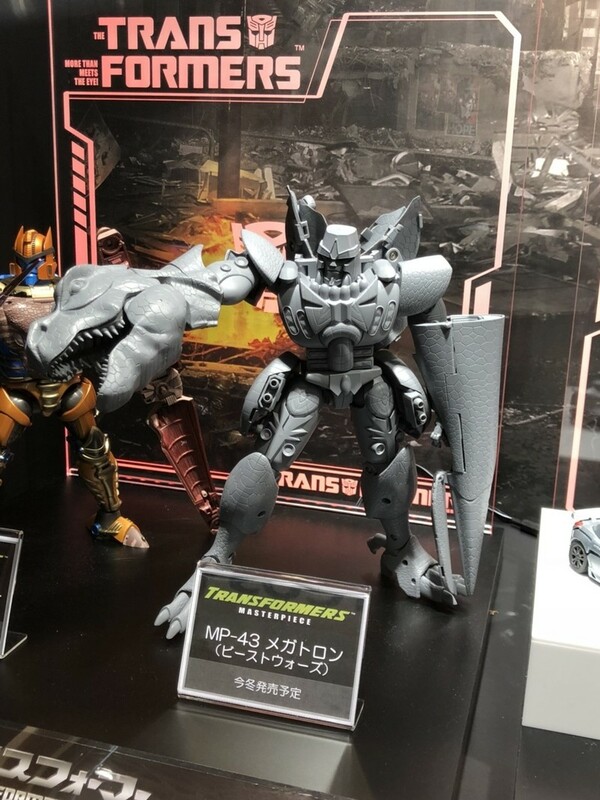 I don't get Beast Wars Masterpiece figures, but wow! Motto: "Peace through Tyranny, Tyranny through Strength, Strength through Stealth"
I literally just squealed when I saw this. This is awesome. ATTENTION! 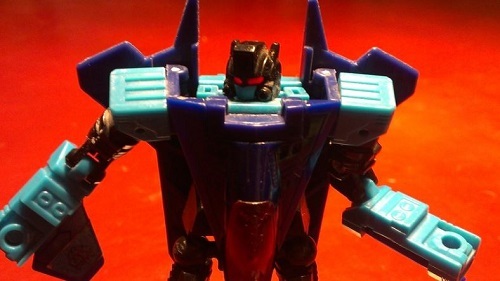 I am seeking a CW Leader Starscream Crown to replace mine that broke. If you have one you want to get rid of, please let me know! PM me for details. Thank you! Rubber ducky can wait for the MP Transmetal version; bring in the toothbrush! RUN FOR YOUR LIVES!! 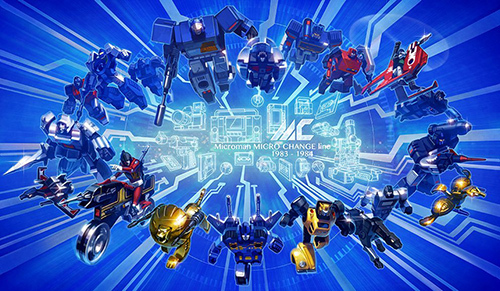 It's raining Megatrons!!!! While I'm sure the price will piss me off, I'll still.be buying this on day 1. Kinda shocked he has the tail grabber/weapon thingy a la the toy not toon. I bet you can remove it to reveal a regular arm and hand. Edit: In fact, is that his thumb sticking out about midway down? Cobotron wrote: Kinda shocked he has the tail grabber/weapon thingy a la the toy not toon. But where’s WJ? Is he still conscious after seeing this? MagicDeath wrote: But where’s WJ? Is he still conscious after seeing this? I'll run up north and check on him. Make sure he didn't hit his head on the coffee table on the way down. william-james88 wrote: Oh my **** GOD!!!!!!! But at least he is as excited as I hoped he'd be! It has be excited. 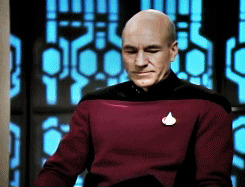 5,496 pages were recently viewed by 716 unique visitors. This page was viewed 1 times on Monday, April 22nd 2019 8:53pm CDT. © 2019 Seibertron, Inc. DBA Seibertron.com. All Rights Reserved. Established June 2000. Seibertron.com is owned by Ryan Yzquierdo.